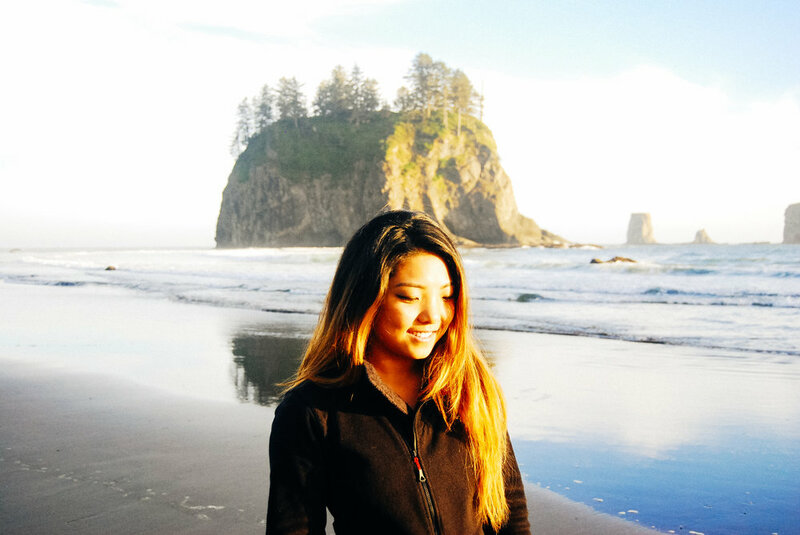 Towards the end of my four years in Seattle, and with a newfound lust for the outdoors, I started freaking out about all of the places I still wanted to see before moving home. One of those places was the Olympic Peninsula. With a long list of sights (that needed to be cut in half) and only 2 days to do it, I was thankful my friend Angel was down for this spontaneous road trip. 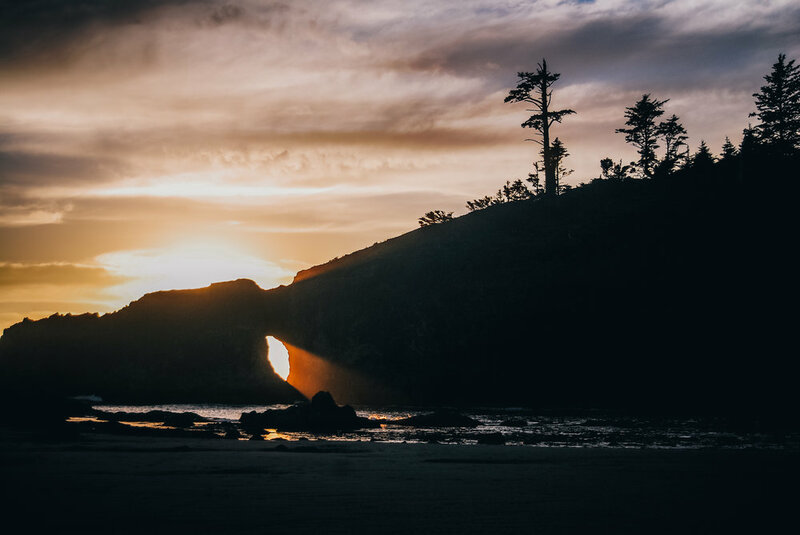 Being a big planner, but overwhelmed with my options, I managed to nail down some important spots: we were going to camp at Second Beach, so we needed to get a wilderness permit and bear can in Port Angeles. 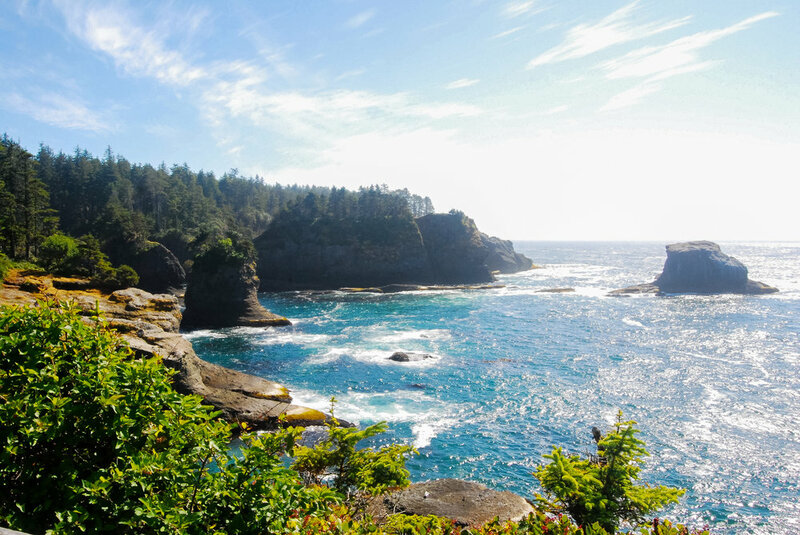 I also really wanted to make the big detour out to Cape Flattery to say I'd been to the most northwestern point in the continental USA! 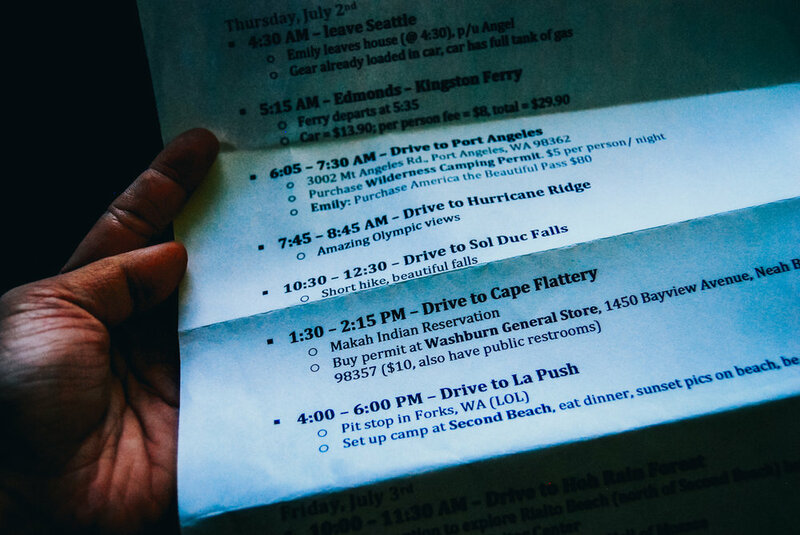 I knew there was so much more to see, but I had to make some decisions, which resulted in my crazy timed itinerary. The first part of our adventure, which I had never done before: drive my car onto the ferry boat! I love the Washington Ferry Boats, so I was a little too excited about this one. Since we were hopping on the ferry around sunrise, we had some gorgeous views. I really enjoy taking the ferry. It definitely helps you to slow down a little more, and enjoy your surroundings. First stop: Port Angeles visitor center to pick up the aforementioned wilderness permit for second beach, and the bear canister! I also bought my very first America the Beautiful pass here, which would become a yearly tradition. I honestly don't know how I discovered we'd need a wilderness permit, and we definitely didn't think we'd have any issues getting one, but there was a sizable line of people waiting for the permits to be issued for the day. We were glad we got one, especially since we had no backup plan! It's always funny thinking back to those first "backpacking" trips: filled with subpar planning & gear, but it always manages to work out. Next up: drive to Hurricane Ridge and admire the beautiful Olympic mountains! This was definitely one of those places where I could not get over the mountains! The layers were ridiculous: the mountains never stopped, and the trees on the nearby ridges looked so tiny in comparison! After we finished admiring the view and taking pictures for our fellow tourists, we hopped back in the car and drove to our next destination: Sol Duc Falls. This was one of those #instafamous locations at the time, and I desperately wanted to see a waterfall. After a super short hike, we arrived at the falls, and took our time snacking, relaxing, and wading in the creek above the falls. 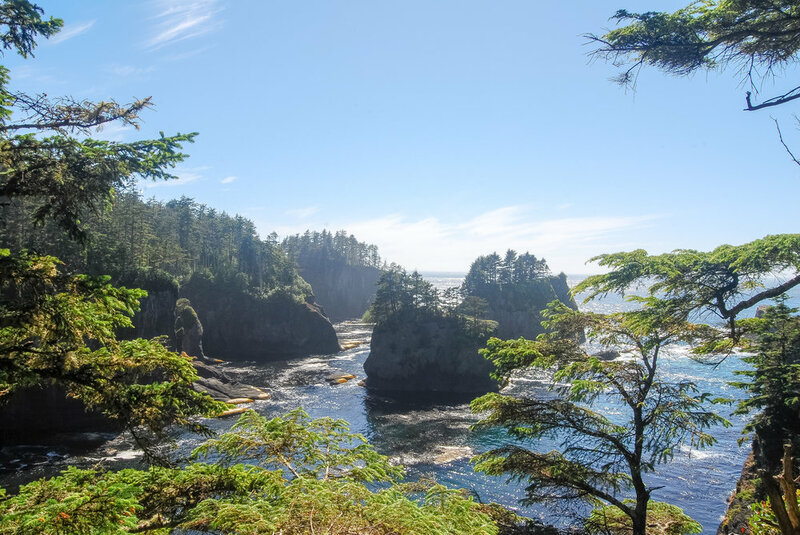 Knowing we still had a long drive to Cape Flattery, we left Sol Duc and continued on. The drive was long, but beautiful. Before getting to Cape Flattery, we stopped in Neah Bay to pick up the reservation permit. Since we would be hiking on Native American land, we needed to have this special permit, which is only $10 for the year. We were shocked when driving through the town. It a combination of poverty and abandonment that we had never seen before in our lives. We knew reservations were impoverished, but you don't understand until you actually go there and see it. The rest of our drive was a little more somber, as we discussed the politics of the treatment of Native Americans and issues reservations face. Our spirits were lifted when we finally reached the parking area and saw how beautiful it was! It was really exciting to be standing at the northwestern most point in the continental USA! In that moment, I made it a bucket list goal to make it to all the four corners of the continental USA. Only 3 more to go! 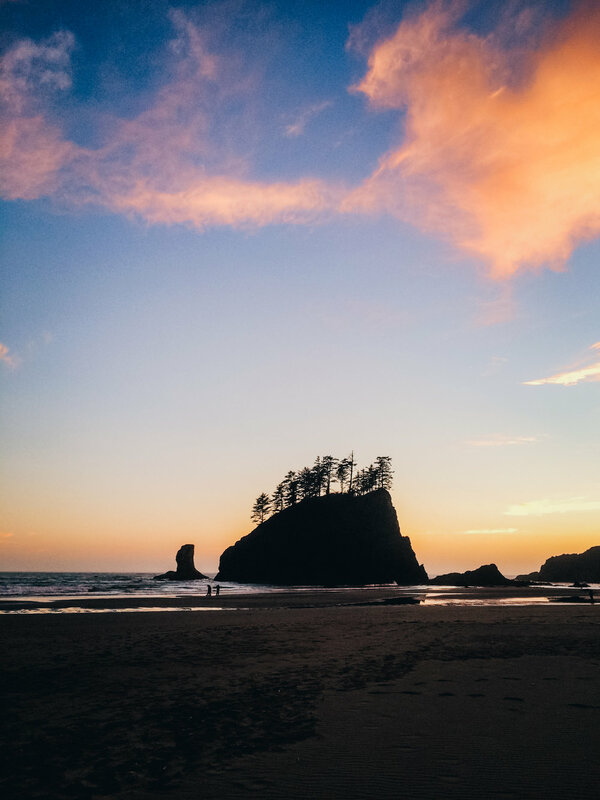 With the sun starting to dip closer to the horizon, we took off again to La Push, Washington to camp on Second Beach. I had seen sooo many beautiful photos of Second Beach, so I couldn't wait to see it myself. I had been to the coast plenty of times in California, and once in Oregon, but nothing compares to northern Washington's coast. It is just so wild. We realized how silly we were while unloading the car and hauling our stuff down to the beach. I had 2 backpacks with stuff in both of them, and was carrying the bulky bear canister, and Angel had a backpack and was carrying the very cheap tent she picked up from Big 5 earlier in the week. We looked very inexperienced. And we were! Neither of us had a backpacking stove, so we just ate snacks for dinner (and breakfast). It was kind of a fail in terms of gear & prep, but definitely a win overall. We entertained ourselves with photography as the sun started to set, and we witnessed an amazingly gorgeous sunset. Even though I woke up many times during the night, I loved falling asleep to the waves. So serene. We slept in pretty late the next morning: the fog had already burned off and it was getting warm! I wish I was awake for the sunrise, I knew it could get really moody on the coast and I wanted to see the huge rocks in the ominous lighting, but waking up that early is always so hard! After packing up our things, we hiked back to the car and headed south for the Hot Rainforest to hike the Hall of Mosses trail. In the weeks & months leading up to our trip, there was a mega heat wave in Washington, and you could really tell in the Hoh! Everything seemed pretty dry: the moss on the trees looked brittle! I decided the next time I visit here, it will be in the fall or spring, and preferably, when its super foggy and/or rainy. We still enjoyed our hike and finished the loop amongst all the trees and ferns. It was a very magical place. And just like that, it was time to head back to Seattle! We had 4th of July plans on Lake Union that we could not miss! 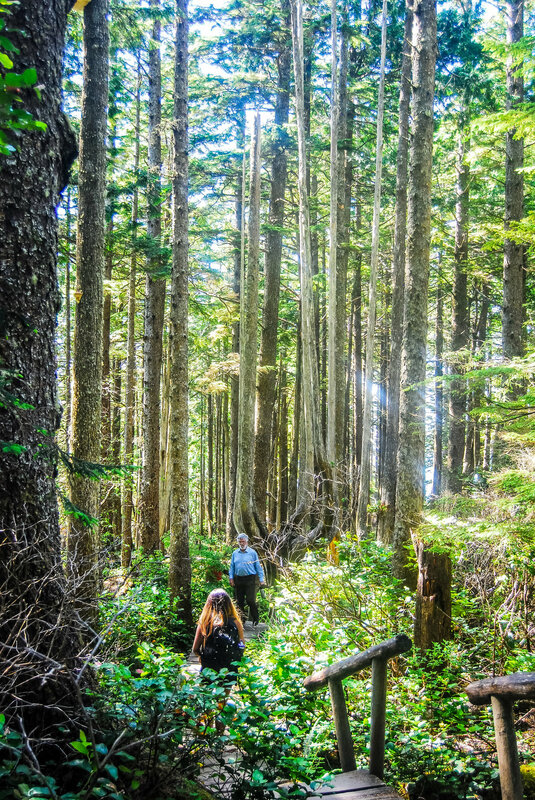 It was amazing to see the diversity in Olympic National Park. I knew there were so many places I wanted to see but needed to be skipped on this trip, and it was sad knowing I wouldn't be back for who knows how long! But it's ok, because in hindsight I learned of many other places I didn't even know about that I need to see! So another trip is definitely overdue. There are just too many beautiful places to see in this world!